It’s been a marvelous, busy year for Bird vs. Bird Designs: new products, new bird designs and so many wonderful new customers. 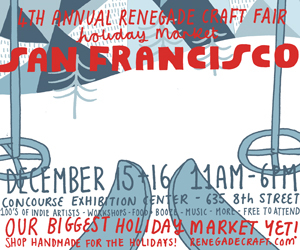 If you live in the San Francisco bay area, I hope you’ll come by the Renegade Craft Fair this Saturday and Sunday from 11-6 at the Concourse Exhibition Center in San Francisco. There will be a gazillion amazing vendors, and I’ll be kicking back at booth 68 with tons of goodies you can’t buy online: stuffed buddies, coaster sets and cute ornaments!